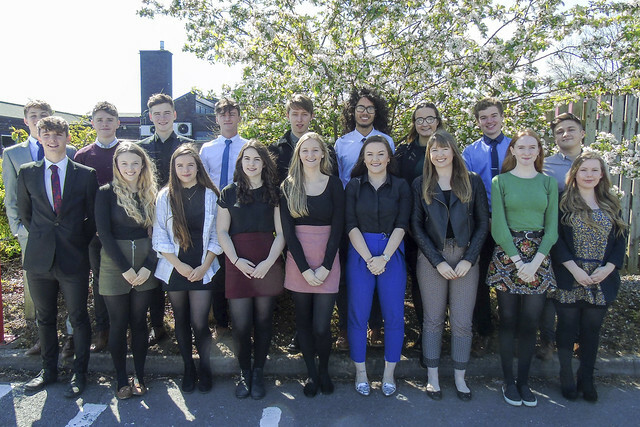 We recently interviewed Year 12 students who had applied to be one of the team Student Managers who have played a key leadership role in the life of the school for many years now. The Student Managers will help to run whole school events and act as ambassadors. There will hopefully be a display outside the Sixth Form Common Room. Look forward to it! So proud of our senior students. What inspirational role models. Mrs F.
"I would like to wish you a warm welcome to St. Mary’s Menston on behalf of the Sixth Form Student Manager team. As Head Boy, it is an honour and a privilege to represent the student community and the school and I hope to fulfil this role to the best of my abilities. St. Mary’s Menston is a school which displays outstanding academic success and allows individuals to develop and reach their full potential. Through upholding the school values, both students and staff create a vibrant and positive learning environment where we strive to become the best that we can possibly be. Throughout my time at St. Mary’s I have been fortunate enough to be given many opportunities that has allowed me to develop both academically and as a person. I would strongly recommend taking the many opportunities that the school offers so you too can enjoy the St. Mary’s experience as I have. One of the key aspects of St. Mary’s school life is our charitable work such as the overwhelming contributions made at the advent appeal as well as the Bambisanani Partnership. Our school also offers other opportunities such as World Challenge, Duke of Edenborough and the Lourdes trip which allows students to develop leadership qualities as well as strengthening our school values of faithfulness, humility, truth, forgiveness, tolerance, dignity, service and respect. As Head Boy, I value your contribution to help making the school a better place; St. Mary’s is built on strong foundations and good relationships between students, teachers and parents and I hope to maintain this through my role." "Having the opportunity to represent such a magnificent school as Head Girl is an absolute pleasure. As a representative of the school, I hope that I can maintain the remarkable values and crucial aspects of the school and I wish to magnify the many concealed assets within the school. St. Mary’s is not only an outstanding school but it is also a unique community filled with individuals who are respectful and tolerant to each other as well as to visitors and members of the public who are welcomed with reverence. The students and teachers of St. Mary's are compassionate collectively, as they grow supportive bonds which motivates the learning ability throughout the classrooms. During my time at St. Mary's I have made many memories and connections with both students and teachers which has been the foundation of my time here. Many opportunities that the school offer have encouraged learning such as; school productions, language exchanges, Bambisanani Partnership and Lourdes. The privilege to go on any of these visits allows students to explore and learn more about the world and themselves as a distinct member of the school, as well as to make fantastic memories and friendships which will last a lifetime. The variety of experiences that St. Mary’s offer gives everyone a chance to participate and enjoy their time at school. Becoming Head Girl has shown me that every experience and your personal attitude can impact your future status and together can enhance your chances of achieving to the best of your abilities and beyond. My time here at St. Mary’s has shaped me to the person I am today and I hope that younger years will look up to me as a role model and develop their individuality so that one day they too can reminisce about their wonderful days at St. Mary’s and be proud to accept that it brought out the best in them." "After being chosen to be Deputy Head Boy, I am proud to welcome you to St. Mary’s on behalf of the senior students. The school encourages and demonstrates certain values to achieve a warm and friendly environment for all students, staff and visitors. These values allow students and staff alike to learn, grow and enjoy their time at St. Mary’s. All of the students here are seen as unique different individuals, all with different aspirations and talents. St. Mary’s recognises everyone’s full potential and works hard to help every individual achieve this. This is promoted both in and out of the curriculum, with an incredible team of staff with a genuine willingness to help others, and a wide range of extra-curricular activities to suit all different personalities. Through annual school performances, a variety of sport clubs and teams and the chance to travel across the world with Lourdes, Bambisanani and world challenge, St. Mary’s provides a well-mixed combination of academic and social success which allows all students to access their maximum potential and the countless possibilities available to them. Personally I feel very lucky to be part have been part of St. Mary’s for so many years. St. Mary’s has allowed me to develop as a person, make great friendships and memories, and allowed me to achieve and be part of many great things. The role of Deputy Head Boy is another opportunity presented by St. Mary’s that I will not take for granted, and I will do my best to fulfil this role and return the welcome I have received throughout my time here." "I feel extremely honoured to be able to welcome you to St. Mary’s, a school full of warm and welcoming students and staff who will constantly strive to help you achieve your potential. Being appointed Deputy Head Girl of such an outstanding school is a huge privilege and I hope to do the role justice, fulfilling it to the best of my abilities. I aspire to use this position to give something back to the school that has given so much to me; hopefully by encouraging students to aim high and get involved with both the school community and academic activities. St. Mary’s is a diverse and exciting community that aims to develop students both academically and personally through offering a range of incredible opportunities - there is something for every student. During my time at St. Mary’s I have had the chance to take part in the truly eye-opening Bambisanani South Africa Trip as well as taking part in many of the school’s stage productions such as Fame, and the annual music concerts. Having also taken part in many school social events and sharing experiences with others, I feel proud, knowing that these opportunities are available and appreciated by all students at our school. This means each and every student will have the opportunity to develop both social and leadership skills. These qualities, combined with many more I do not have the space to mention, are what make St. Mary’s the outstanding school it is and why I am so extremely proud to represent St. Mary’s Menston as Deputy Head Girl."